Asclepias asperula (Decne. ) Woods. subsp. capricornu (Woods. ) Woods. Stems: Decumbent to ascending, few to many, 6 to 24 inches long, radiating from crown, simple to sparingly branched, glabrous or minutely pubescent. Leaves: Mostly alternate, simple, short-stalked, firm, ascending to spreading, lanceolate, 1.5 to 8 inches long, .5 to 1.25 inch wide, nearly glabrous or sparsely pubescent; margins entire; tips pointed. Inflorescences: Umbels, solitary, sessile or short-stalked, subtended by 1-3 leaves, 9-34-flowered, terminal. Flowers: 5-parted, 1/4 to 1/2 inch tall, on stout stalks 3/5 to 1 inch long; calyx lobes lanceolate to ovate, green to purple-tinged, minutely hairy; corolla lobes elliptic-lanceolate, pale yellowish green, glabrous, curved upward; hoods club-shaped, purplish; tips incurved, usually greenish cream; horns absent. Fruits: Pods, spindle-shaped, 1.5 to 5 inches long, 1/2 to 1 inch wide, minutely hairy, erect on downward-curved stalks; seeds egg-shaped, tufted with light tan hairs at tips. 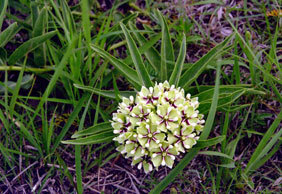 Habitat: Dry rocky or sandy prairie uplands. Uses: The Navajo used this plant to treat bites from rabid animals. Comments: The fruits resemble the horns of antelope as they elongate and begin to curve. Spider antelopehorn will ooze a milky fluid when injured. Formerly treated as Asclepiadaceae - Milkweed Family. Resembles Spider milkweed Asclepias viridis.